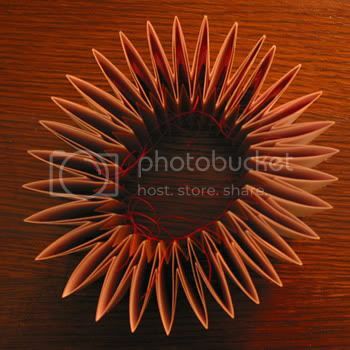 I use the "longstitch through a slotted cover" quite often. I wish it had a better name, but "longstitch" is too general, so I'm just using the title that Keith Smith has given it (p. 141, Vol 1 Non Adhesive Binding). 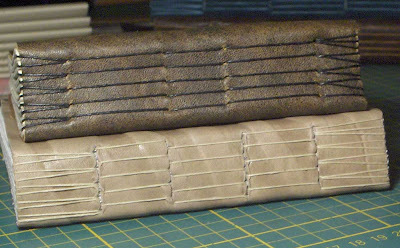 This binding works really well with most leather and I really like how it looks with the staggered lines and it is such a stable, secure, strong binding. After doing a million of these books, I made a fantastic discovery. After making the holes in my sections, absentmindedly I also made holes in the cover...rather than slots. After just a little consideration, about three seconds, I decided to try it anyway. So I used the same sewing process, just going through holes rather than slots. And, I sewed two sections through each row of holes. I know it looks the same at first glance, but it creates (nearly) straight lines on the spine. Of course, you say, that is simple enough. But I was amazed, astounded, aghast. Now this clean, strong binding that I love so much, is also symmetrical! 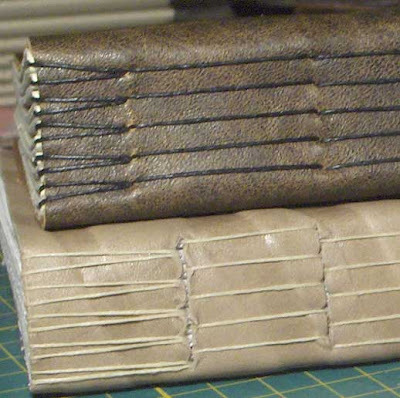 This picture shows the book sewn through holes (top) and another one sewn through slots. I suppose I haven't truly discovered anything; I'm sure somebody has done this before me. Actually, I just went back to Smith's book and he does make a brief mention of doing this binding with pierced sewing stations. He doesn't elaborate that suggestion at all, but I suppose this is what he was talking about. Beautiful! I love those happy accidents that reveal things we would never have thought of otherwise. Its what creativity is all about I think, having the guts to go with something even though it may seem 'wrong', just going with the flow and discovering the unexpected. I love your books, and thank you for sharing this insight! Isn't it wonderful when you make a discovery like this? I always think that it must sound silly to others, but I always feel a bit like an explorer finding a new land. Congrats on the discovery, it's always nice to tweak a style of binding. Bindining to me is all about trying new techniques or materials. thanks for the pats on the back! Oh my wow golly -!! I never ever thought of doing it that way and using the holes instead of the slots!! 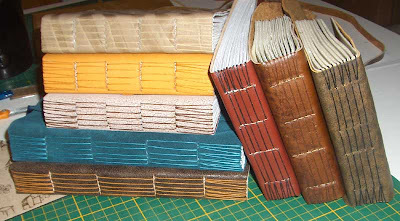 I learned this binding from susan mills a while ago and just have loved making books that way!Thanks for this very very useful tip! Hi , this is the most useful site ever! im a first year printmaking student at uni and my teachers are so impressed with my books , thanks so much for giving us this wonderful resource! There's lots of leather on Ebay - I've got a lot of nice leather there.